Last week my development directorate have a birthday and bought an Opera cake from harvest cakes. This picture i get from the harvest website.The taste of the cake it’s like cappuccino cake or coffee cake. We get 20 X 30cm size and the nice thing is we share ONLY for 6 person in our division, everybody are in Cilegon (Banten Province Near Jakarta). So everybody has a very large portion of the cake. Well that’s week ago, now my boss is having a birthday, i thought that we are goin out to a restaurant or something on lunch (her treat) but we can’t because there’s one employee of my division are in Lampung, so we wait for his comeback. But until his comeback from out of town, my boss bought us a cake :D (oh I love my division). The cake is Strawberry Cheese Cake from harvest too. 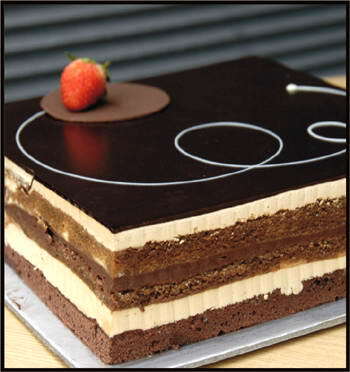 The cake is quite tasty, but u can’t eat it too often, because it really make your stomach full. The cheese are combine with strawberry on top(Doh!) and the texture of the cake are soft with sweet cream surrounding the cake. The strawberry aren’t sweet but still it’s a nice experience eating this cake. 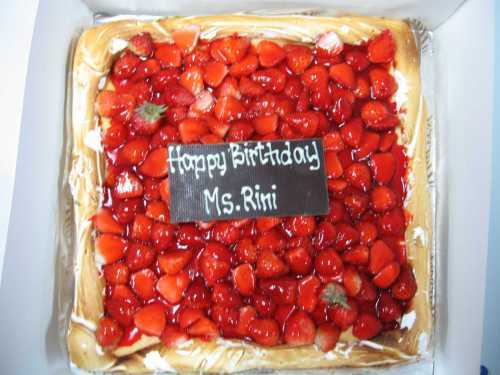 The Cost of the Cake that my boss bought is around Rp.230.000 size 20 X 30cm. it’s around US$24. if u bought it with delivery add US$4. maap nimbrung mba. pernah denger harvest emang belom ada label halalnya, gatau kalo sekarang. bukan karena pake alkoholnya. tp dia pake gelatin, yang kebanyakan gelatin itu gak halal. tapi bisa juga salah. mohon pencerahan. klo masalah gelatin gw gatau, tp gw aga yakin dia make yg gelatin buatan indonesia yg notabene dari ekstrak tulang sapi, bukan babi. gelatinkan ada yg halal jg (oh ya, permen yuppy gada label Halal, inget ), btw cheese cake ga pk gelatin seinget gw, itu produk2 jelly doang. tp ini utk blueberry cheese cake yg bentuknya square yah, klo yg bentuknya round, iya, klo ga salah dia blg make rum ato alkohol gtu, makanya gw stay off ama all product of round cake in harvest. kemaren saya iseng ke harvest, pengen nyobain aja. dia emang blm ada label halal MUI, tapi seperti yang dian sebutkan, pelayannya emang bilang: kalo yg loyang kotak tuh ga pake rhum, tapi yang loyang bunder pake. enak bangetssss emang. but that was the first and my last shop there. suami ga sreg kalo blm ada label halal-nya.